Well, it has been quite manic! we've had the builders and plasterers in, and we seem to be living in a constant cloud of dust, so i've been finding myself retiring more to my studio for some calm. I decided to do some spring styling in here to cheer me up. And spring is my favourite season! So styling with big blooms is in! 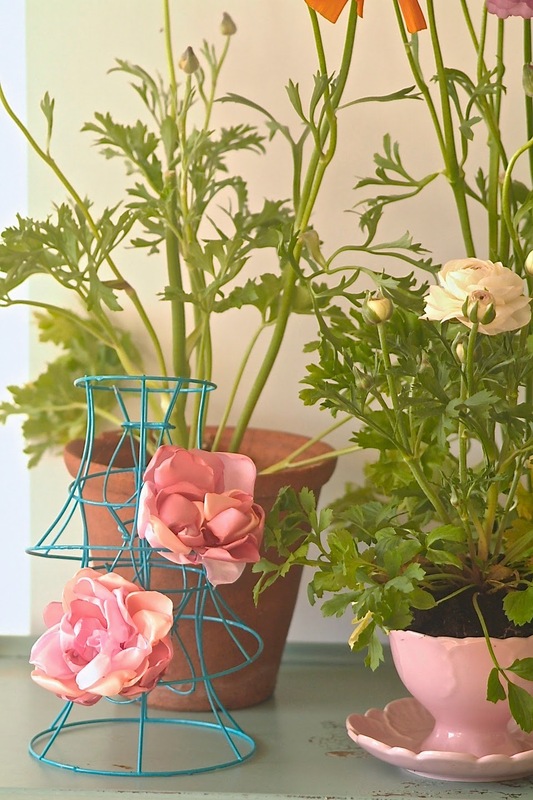 I just adore ranunculus blooms. They are the flower that just keeps giving, with such pretty ruffles and colours from the purest white to the deepest purple, whats not to love!? Spring in our house always happens in a teacup, and this big petal cup and saucer is perfect, and sits nicely with my handmade silk flowers. I hope you are all enjoying spring! I'll be glad to get my house back soon too. And I hope to return to regular blogging at the end of this month when my online store is re-launched.